Buying and selling is child's play with Home Exchange! 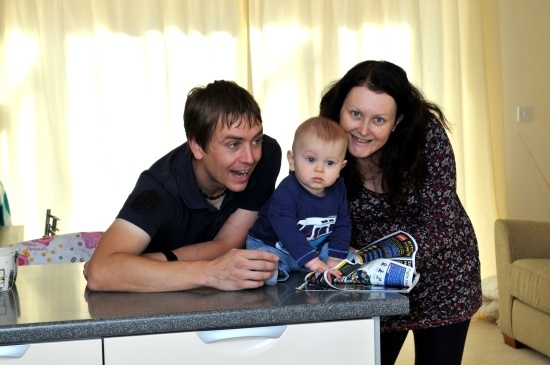 When baby Max Cundiff was born his proud parents Karen and Tom knew they needed to find a new home - but the problem was they couldn't sell theirs. Their two bedroom, terraced house in Macclesfield just wasn't big enough to cater for them and their new addition and they desperately needed to sell it but hadn't got a buyer. It was during a 'drive around' Congleton that they discovered two things that were to turn their house move dream into a reality - Bovis Homes' Brook Valley development and its Home Exchange scheme. Karen said: "We'd wanted to move for a couple of years but despite the house having been on the market there was little interest and no buyers. "We made some improvements to it and thought we would have to stay put, but once Max came along we realised we just couldn't stay there. "We immediately liked the location of Brook Valley and the fact that Bovis Homes offered Home Exchange meant they would buy our old home off us so we could have one of their new ones. It was just what we needed to enable us to move." The couple had already decided they wanted a new home to avoid the refurbishment, decoration or ongoing maintenance that often comes with a second-hand home. "We just didn't want the hassle of an older house, there is always something to do and having Max meant we just wouldn't have the time anymore," said Karen. They reserved a three bedroom, three storey Padstow town house that gave them plenty of living space over the ground and first floor plus a top storey with an en suite bedroom for them and a separate bedroom and bathroom for Max. Karen said: "The Home Exchange scheme worked really well. Our old house was surveyed, then valued by two estate agents and based on their valuations we agreed a selling price with Bovis Homes. We were very pleased with the price Bovis Homes offered and we stayed in our old house until our new one was built and ready to move into." Another great feature of the scheme is that as well as cutting down on stress, the buyer can also save thousands of pounds because they avoid costly estate agent fees. "For us Home Exchange took a lot of the hassle out of the buying and selling process," said Karen. "I'm so glad we did it; now Max is crawling and trying to walk I don't know how we would have coped in our old place."